There is no one particular style of church architecture in Canada that is specifically Ukrainian. Rather, there are a great many of styles of Ukrainian churches in Canada. Some have drawn influence from the churches of various regions of Ukraine while others are more based on modern tastes. In some instances Ukrainian-Canadian churches exhibit elements of styles from various regions of Ukraine. Still others may have been originally built for use as a church of another religion then purchased by Ukrainians and renovated for the Eastern Rite. What has developed in Canada are styles that are hybrid varieties of Ukrainian church architecture. Ukraine has many styles of churches and there, too, it might be said that the styles are hybrids. The ecclesiastical architecture of Ukraine is descended from a heritage that goes back to the time when the grand princes first brought Byzantine architects to build many of the earliest churches in Kievan-Rus. Thus, the most notable church in Ukraine, St. Sophia in Kiev, as well as many others, was directly influenced by the design of Hagia Sophia in Constantinople (now Istanbul). However, the architecture of the Byzantine Empire did not develop in total isolation either. Byzantine style churches originally drew influences from Roman, Jewish, and Syrian architecture. Thus Ukrainian churches in Canada have an “architectural lineage” dating back thousands of years. 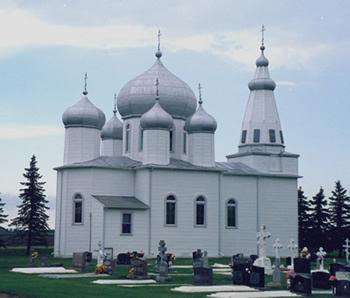 The menu on this page will introduce you to some of the most common forms of Ukrainian church architecture found in Canada. The list is not all encompassing; nor will every church fall neatly into a specific category of style.